For a statement of current tuition and estimated expenses, visit the Office of Financial Aid. Note that a distinction is made between those students who are regarded as Michigan residents and those who are not. To be considered for a merit-based scholarship, all application materials must be submitted by the deadline; in most cases this deadline is December 1. The audition/interview must be completed no later than the end of February. Students who meet all application and audition deadlines and are subsequently offered admission will automatically be considered for SMTD scholarships. There are no merit-based or scholarships available for summer study or part-time study. Official offers of SMTD scholarships are made in writing by the Associate Deans; other discussions of possible assistance are not considered binding. The deadline to respond to an SMTD admission and scholarship offer is April 15. Nearly all DMA and PhD students receive full-tuition fellowships for full-time study. Most also receive health benefits and a stipend attached to a Graduate Student Assistantship, which can vary depending on the appointment fraction and corresponding duties. 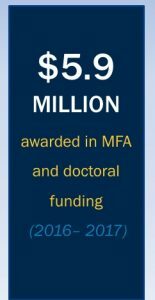 In addition to the funding packages offered by SMTD, DMA, PhD, MA, and MFA students are also eligible to apply for a wide range of fellowships to fund research, travel, and performance. A GSI (Graduate Student Instructor) is a graduate student employed in a teaching position at the School of Music, Theatre & Dance. GSIs coordinate and teach some courses while assisting a faculty member. A GSI appointment provides students with a full or partial tuition waiver. Any graduate student in good academic standing is eligible for consideration. Notification of financial awards made through the School will be sent electronically beginning in March through early April. Each student in a masters or specialist program in music who receives a fellowship through the School and elects performance lessons is required to perform in a major ensemble of the School unless waived (through petition) by the Associate Dean. Financial awards are made for the standard duration of the degree and are typically renewed annually assuming satisfactory progress and subject to any conditions stated at the time of the award. Standard durations are 2 years for masters study, 3 years for DMA study, and 5 years for PhD study. 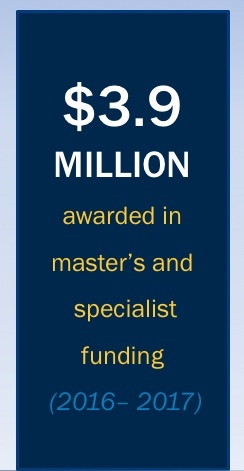 Although financial awards made by the School are based primarily on merit, other considerations may include the need for balanced instrumentation, the competition in the student’s field from other institutions, and the availability of graduate student assistantships in the student’s department. When a student does not receive an award it is normally because insufficient funds are available and the students offered awards were judged to have greater merit. Graduate students who wish to appeal a decision concerning SMTD awards may do so through their Admissions Counselor. Questions concerning graduate assistantships should be directed to the Associate Dean for Graduate Studies & Research: 734-764-0590 or smtd.rackham@umich.edu. Questions regarding merit-based awards should be directed to the SMTD Office of Admissions: 734-763-5112 or smtd.admissions@umich.edu. SMTD strongly encourages all applicants to apply for need-based financial aid. To apply, submit the Free Application for Federal Student Aid (FAFSA) as soon as possible after October 1 but no later than March 1 to be considered for all eligible aid programs. U-M’s Federal School Code 002325. There is no cost to submit the FAFSA, which is available online at www.fafsa.ed.gov. Awards made on the basis of financial need are available through the Office of Financial Aid. U.S. citizens and holders of permanent resident and immigrant visas enrolled full-time in graduate degree programs are eligible for the Federal College Work-Study (CWS) program, and the Federal Direct Loan (both subsidized and unsubsidized) programs. Questions concerning need-based awards should be directed to the Office of Financial Aid at 734-763-6600 or by email: financial.aid@umich.edu.